I originally found this recipe in a tailgating magazine, but unlike most recipe immediately changed it into what I wanted it to be. Hubby loved it and requested it again for next week. Heat avocado oil in a large skillet. Dissolve beef bouillon cube in beef broth and Worcestershire sauce. Add beef, onions and carrots, stirring frequently to saute’, breaking beef down into the smallest of crumble pieces. While beef is cooking prepare potatoes in salted water until mashable. Sprinkle with nutmeg, salt and pepper. Add broth mixture and cook until meat is cooked through and liquid has been completely absorbed. Add peas and cook a few minutes more. Set aside. When potatoes are done drain off water and add 2 tablespoons butter, cream, salt and pepper, mixing well. 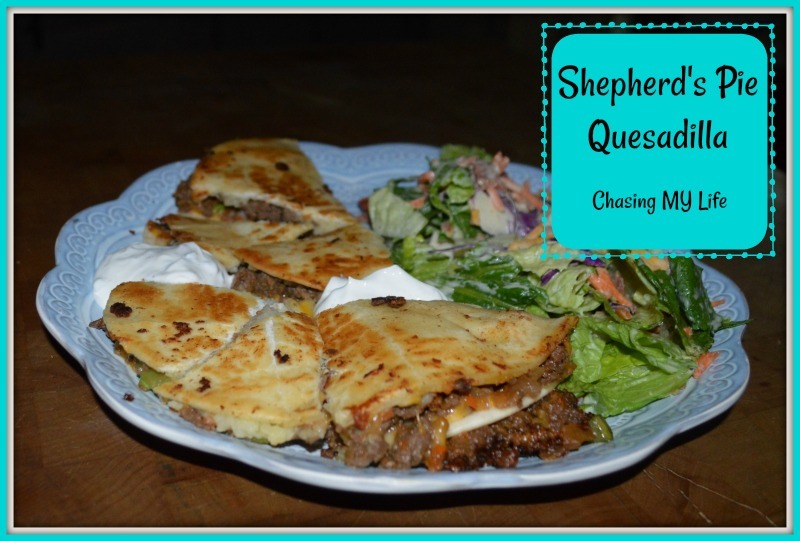 Assemble quesadillas with a layer of mashed potatoes, meat mixture and cheese. Heat additional 2 tablespoons of butter and cook quesadilla until browned on each side and cheese is melted. Cut with a pizza cutter and serve immediately with Jalapeño sour cream. NOTE: A quesadilla maker works REALLY well. Soak red jalapeños in beef broth for 30 minutes to reconstitute. Drain well. Fold jalapeños into sour cream and season to taste. This is a very special Quesadilla and we will love this sauce! Your post is awesome and thanks so much for sharing it with us at Full Plate Thursday. Hope you have a great week and come back to see us real soon!